The Color Red alert sounded in Sha'ar Hanegev Regional Council. A projectile landing site was found shortly afterwards. No injuries were reported, but a henhouse in one of the council's kibbutzim sustained some damage. Israel has lodged another complaint with the UN Security Council, condemning the rocket barrages fired recently on the Jewish state from the Gaza Strip. Israel's ambassador to the UN, Ron Prosor, wrote in the letter that a million civilians are under risk of being hurt in the attacks, and warned that the Security Council's inaction could exacerbate the conflict. Who can be against a complaint to the Security Council against terrorist rocket fire targeting a million civilians? Why, Mahmoud Abbas' Fatah party, of course! 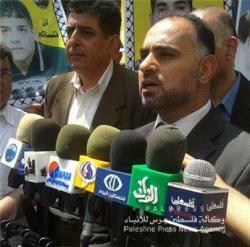 Once upon a time, the Fatah-dominated PA would issue automatic (and quite insincere) condemnations of terror attacks. Now they make quite clear what side they have been on the entire time. Who painted this picture of the Third Temple? Summertime Appeal: Donate to EoZ! Open the pod bay thread, Hal. Outrageous: AP turns terrorists into "art"
1967: "Jews would become fish food"